Today Pure Data is a visual programming language, which allows you to develop software for music composition, or simply a language for making music, free and open source. But, from a historical point of view the question it’s bit more complex. With this post I’m trying to trace the development path of Pure Data. Miller Puckette – This path is intertwined, inevitably, with that of Miller Puckette who is the creator, who at the date of birth of Pure Data (commonly it is also referred as PD) had collected a long and valuable experience in software and music systems development for computer music (I want remember that Puckette had also participated in the design of the Synthetic Performer), culminating with the creation of Max/MSP in about 1987. The limits of Max/MSP – The starting point for Pure Data, as pointed out by Miller Puckette, was the analysis of the limits that burdened on Max/MSP in the Mid-Nineties. According to the mathematician, in those years, Max was an environment that is best expressed in operations such as the construction of filters, virtual synthesizers and other instruments, but that revealed important limitations if we moved from the processes management to data management,  an element, the latter, which in part explains the name Pure Data (in part, because Puckette writes that PD stands for public domain also, to emphasize that it is free and open source environment). 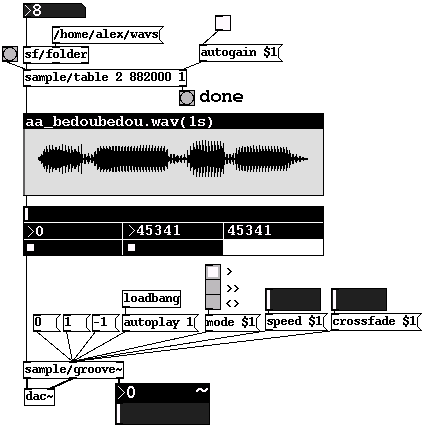 A sample picture of some objects in Pure Data, linked together to create complex instruments. 3. have the opportunity to compose music making of graphic scores, similar to the model of the UPIC system by Xenakis. It is clear that even today Max/MSP has filled the gaps of the nineties, but in those years the structural limits of Max pushed Puckette to create a new working environment. A recent image of Miller Puckette which presents some news in Pure Data. Early versions – Pure Data blended the best that was done with Max / MSP, with innovations capable of responding to the needs expressed above. A first version of PD was made in 1996 for the IRIX operating system, by the Silicon Graphics (SGI). In 1997, this first version was extended to Windows NT, Linux, and then finally, in 2002, PD has also been developed for Mac OS 10.1. 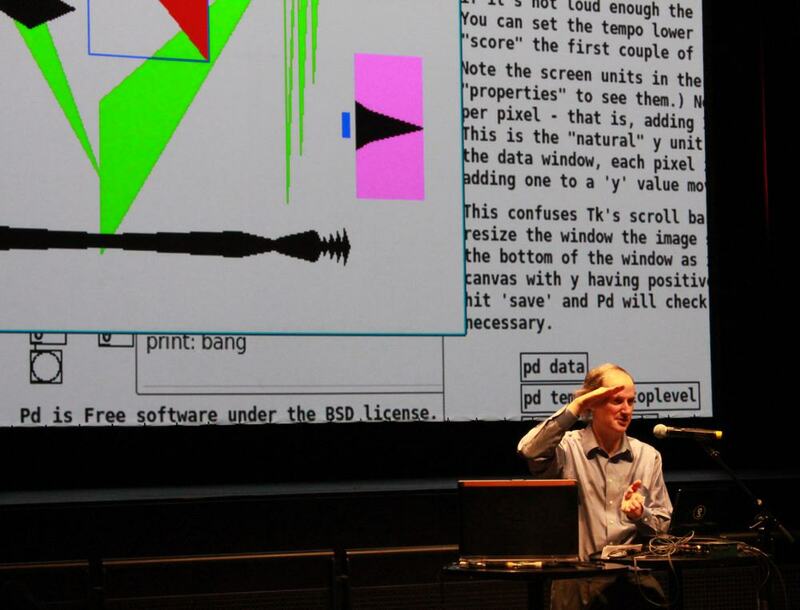 The first presentation – The presentation of PD, there was on the occasion of International Computer Music Conference in 1997 in Greece, during which the observers could witness the execution of Lemma One, a working collaboration between the visual artist Vibeke Sorensen, the American composer Rand Steiger and a staff of Miller Puckette, George Lewis and Mark Danks. The song included an improvisation built with digitally synthesized sounds and computer graphics. The idea was to use data from a source to modify and control the parameters of the other. Another special feature of this project was in a different geographical location of the two groups, one of which is based in Thessaloniki, conference venue, while the other presumably in the United States, interconnected via an ISDN connection. 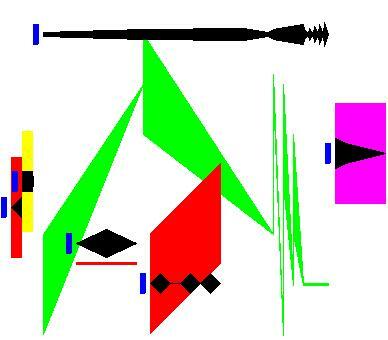 A graphic score realized ​​with Pure Data. 2) PD Extended: which corresponds to the basic version integrated by the libraries of the community, able to work with video, graphics and many other features. Miller Puckette, Pure Data: Another Integrated Computer Music Environment, Proceedings of the Second Intercollege Computer Music Concerts, Tachikawa 1997, pp. 37-41. Miller Puckette, Pure Data, Proceedings of International Computer Music Conference, Salonicco 1997. Miller Puckette, Using PD as a Score Language, Proceedings of International Computer Music Conference, 2002.